The other part of charging line need to be connected with a standard USB interface to start charging. download and install "Hero Band". 1.Compatibility: Support for Android 4.4 & above; IOS 7.0 & above. 1.Pedometer-Calculate the steps,walking time,destance,calorie consumption,drop the page down to synchronize information with bracelet,check the current day's sport information. 2.Sleep monitor-wearing this bracelet,it will automatically monitors your sleep,you could know your sleep data including deep sleep time/light sleep time/total sleep time. 3.Health detection-Calculate current health information:Blood oxygen detection/Heart rate detection/Bood pressure detection/Fatigue. One-key examination:Click one-key examination on Hero Band App,you can know your heart rate,blood oxygen,blood pressure,fatigue(Data only for referrence,not for medical use). when detecting,please put your wrist at the same height of your heart.or wear arm brace arm horizontally on the desktop. 5.Blood pressure timing monitoring:after starting monitoring mode,the bracelet will automatically monitor the blood pressure every 1 hours during the setting time. 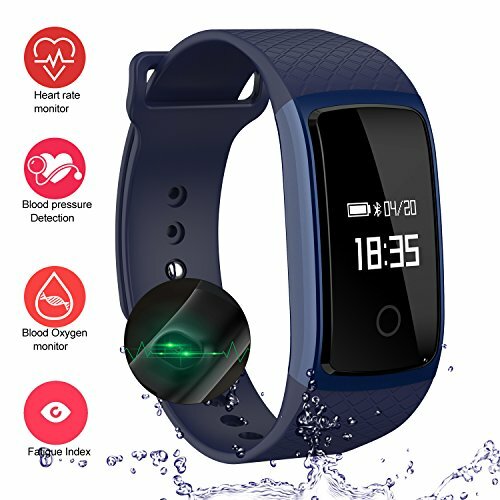 【Fitness tracker with heart rate monitor,blood pressure,blood oxygen】:The device can measures the present blood oxygen, blood pressure, heart rate,measuring method:Click one-key examination on Hero Band App,please wear arm brace arm horizontally on the desktop,keep your wrist and your heart at the same height before you test blood pressure，and also this is not a professional turgoscope, there exists 10-15 error, It can't use as a medical purposes, just for reference. 【Sleep Monitor and Pedometer Bracelet】When you fall asleep with this bracelet,this fitness tracker will automatically monitors your sleep,the step counter is calculated by the swing of the arm,if you are washing the clothes(wearing the tracker)and then it will be calculated in steps. 【How to connect bracelet with Hero Band APP】:Open Heroband APP-Open Bluetooth and GPS-Sign up with your email-Go to your email to find the verification code(or maybe it will appears in your spam mail)-Then use the verification code to log in.,charge methods:find the charging touch spot at the back of the bracelet,use the charger aim at the touch spots for charging. 【Compatibility With Andriod 4.4 or above,ios 8.2 or above】:The app supports most smart phones with Bluetooth 4.0. Support system: iOS 8.2 or above (iPhone SE, iPhone 5/5S/5C, iPhone 6/6S plus, iPhone 7/7S plus, etc. ), Android 4.4 or above(Samsung Galaxy S8, S7/S7 Edge,etc ). If you have any questions about this product by LogHog, contact us by completing and submitting the form below. If you are looking for a specif part number, please include it with your message.